The Palladium in Cologne was not completely full, but there was still around two thousand people there to see WITHIN TEMPTATION on stage. The support act, EGO KILL TALENT, started on time – do you know them? I didn’t… They are a Brazilian rock band and apparently one of the 20 most relevant Brazilian artists of last year. Their live performance was not bad, but it didn’t really grab me. The song material was a bit too progressive for my taste, to be honest, and I felt bored. In my eyes, BEYOND THE BLACK would have been a better fitting support act. But eight songs later and after a beer break, WITHIN TEMPTATION entered the stage. Starting with their brand new song ‘Raise Your Banner’, which was released one day before the show, the audience instantly starts to burn. The bight star Sharon den Adel brought a flag on stage to visualize the message. 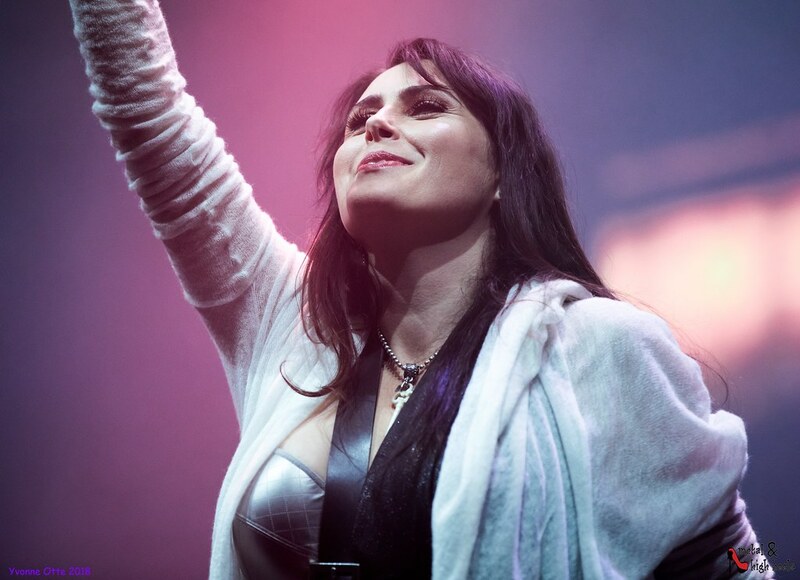 The expectation that WITHIN TEMPTATION will do a gorgeous live show seemed to be confirmed. With a big screen and light show, WITHIN TEMPTATION are able to create the fitting visual background for each song. 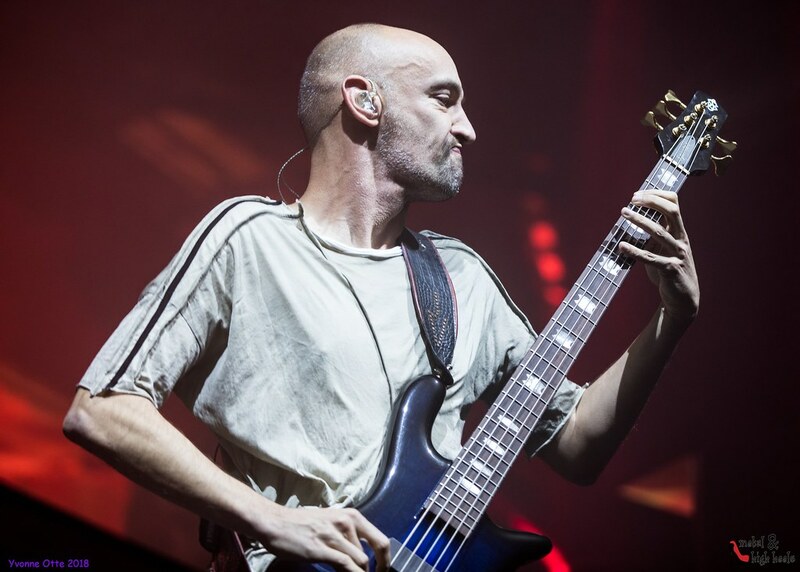 The next two songs were also new material before playing older stuff of the albums “The Unforgiving”, “The Silent Force” and “The Heart Of Everything”. It was a short journey through the band history before presenting us ‘Supernova’. This song was my personal low point of the show. 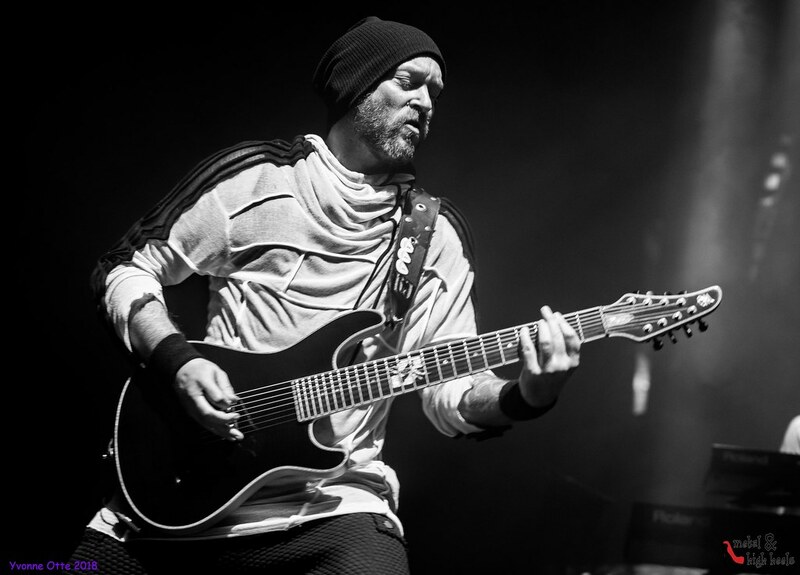 It represents the bad part of the “modern” WITHIN TEMPTATION, a band wanting to come out of their former gothic corner and develop a modern, bombastic and often radio-compatible sound. My personal highlight followed two songs later: the acoustic version of ‘Ice Queen’ began as an intimate duo of guitarist Stefan Helleblad and singer Sharon den Adel and evolved to a powerful and dynamic song. All in all, Sharon‘s vocal skills were amazing! She hit all the notes so easy and safe. Some vocal lines were improvised but always in a good way. Sharon den Adel is a great live singer and charismatic entertainer! Well, what else? WITHIN TEMPTATION did a lot of collaborations on the lasts albums. It’s always hard to perform these songs live. Is there a guest singer? Play the record in the background? The band chose the second option and played the respective singer on video. That was no problem with ‘What Have You Done’, but the playback for ‘Paradise (What About Us? )’ mixed Tarja’s voice in a strange way. What a shame, it’s such a beautiful song! The two hours flew by and at the end there was an unexpected surprise. For the encore ‘Stairway To The Skies’. Sharon changed her dress, okay, so what? But after one minute she started to fly on a wire and continued singing the song two meters above the ground. It was a wonderful scenery – the dress, light, and music fitting perfectly together – a great finale for WITHIN TEMPTATION‘s performance! WITHIN TEMPTATION‘s album “Resist” will be released on February 1st, 2019 instead of December 16th, 2018 due to production problems. Do you want to see more photos? No problem, just go to Yve’s Flickr Page. Will you buy the album? What do you think about the development of WITHIN TEMPTATION? ‹ M&H 36 – Epica	› Interview: Christian Fein’s #KeinerBleibtAllein-initiative helps people find companionship over the holidays.